I just returned from the frozen outdoors after today's Lower East Side Street Art tour, taking in some of the city's most interesting and illegal art. Lia, our awesome guide, showed us a million stickers, tags, wheatpaste posters and murals, and I've done my best to remember a few of them are so you can tour at your own leisure. One thing to remember--beside the fact that these works can fade into the city's background noise if you're not looking for them, they're also fairly ephemeral. Since the works are mostly illegal, they're constantly being torn down or painted over, so each time you pass by you might see something entirely different, but that's part of the fun. Next time you're in Chinatown, be sure to stop by 190 Bowery--the towering and seemingly abandoned building on the corner of the Bowery and Spring (above). It's absolutely covered in art, so you get the chance to see a whole lot of artists all at once. And yes, someone does live in there. 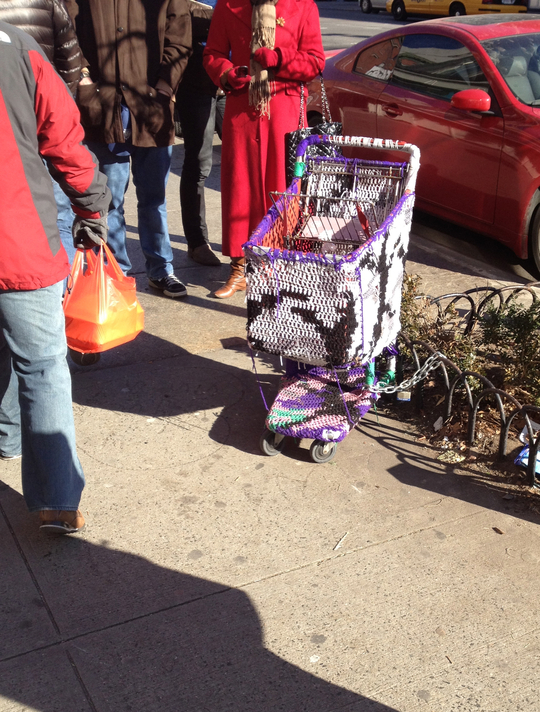 This lovely crocheted shopping cart was made by Olek. This piece is down on the Bowery near 2nd Street (above), and we also spotted a bike she'd covered in yarn down near Canal on Greene Street (top photo). Amazingly, despite the fact that the cart is just chained to the little fence there, it's managed to survive more than six months on a busy street without being stolen. The yarn's a little frayed and weathered, but it's still super charming and colorful. Roa paints animals (above), often in abandoned or run-down spaces, that are native to the area where he's working. 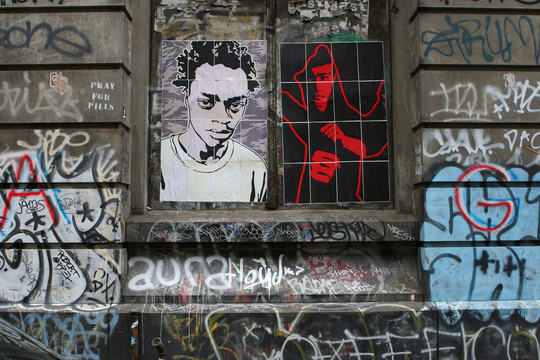 You can spot two examples of his work--a rat and a sparrow--side by side on 2nd Street between 2nd Ave and the Bowery, and if you look hard, you can even see the rat in this Streetview shot. The animals are often large, mostly black and white, and really quite awesome in person. 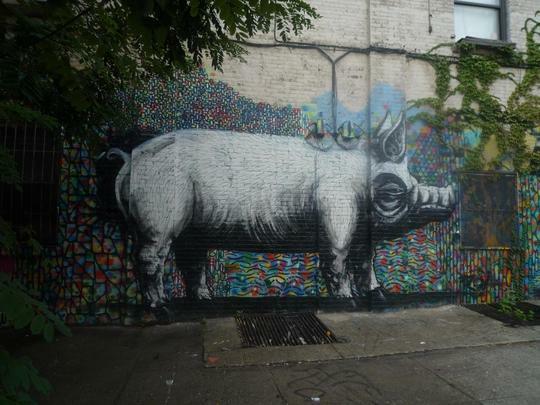 Check out this tumblr for a good sense of his work and some spots to see it in Manhattan and Brooklyn. 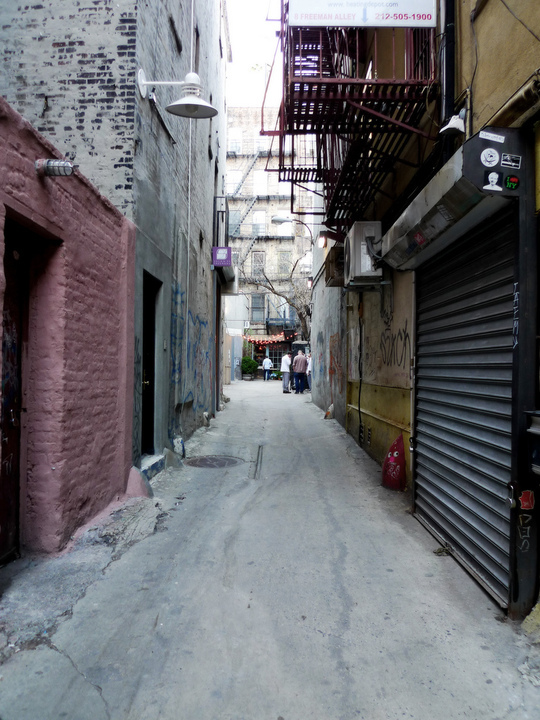 Similar to 190 Bowery, Freeman's Alley is a great place to see lots of artists working all at once. Keep an eye out for the jellyfish on your left side. Plus you can sneak off and grab brunch at Freeman's while you're down there. Thanks to Lia for showing us around! I, for one, promise to spend less time looking at my phone when I'm wandering around down there. PS - If you're interested, Lia's ramping up to do more street art adventures in the coming months. Check out saddleshoetours.com for the details. Guide to Public Art in New York City!